The creation of four large-scale artworks and a number of smaller graphical elements for a Young People’s Unit, commissioned by Teenage Cancer Trust and working in collaboration with Willis Newson and Allford Hall Monaghan Morris. After a consultation period with hospital staff, patients and Teenage Cancer Trust a useful overview of what would suit each unique space and its audience became clear. The birds, framing one of the unit’s entrances, face onto an adult waiting room, so tie-in with an already existing artwork theme. The social space required a bright and colourful visual, that also referenced a love and escapism in music. Another entrance introduced the theme of ‘Area 61’ to visitors, so features a busy landscape of whimsical robot activity that viewers might appreciate details within time and time again. And the main corridor, leading to the unit’s reception, suited an artwork that not only could be returned to many times over, but may also encourage and uplift patients and visitors. A large meeting room mural illustrating a positive phrase. 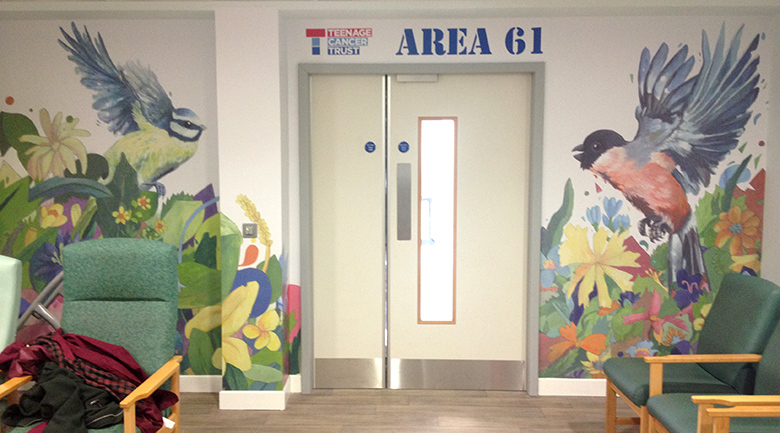 A series of artworks along the entire length of a corridor inside the Bristol Royal Hospital for Children.